Sometimes the old stand by’s never die, or at least are still around when you need them. This blog post is about the oft forgotten, seldom understood method of scripting called SAP GUI Scripting. 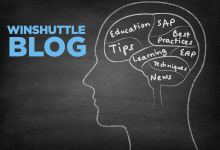 In 2008, Winshuttle added the ability to use this gem from days gone by to transactionSHUTTLE version 8. We ran into a number of customer situations that could be resolved with GUI Scripting, but couldn’t be done with Batch or Non-Batch Input Mode. We wanted to help our customers who had major business pains with these transactions, so our snap development team got to work on adding GUI Scripting to version 8. We tested it with our customers that needed the functionality, and they loved it. We liked the ability to have another powerful tool in our toolbox. Then we started to run into a problem. Customers would want to use GUI Scripting to automate a transaction in SAP, but their BASIS team would have GUI Scripting disabled. Then there were situations where the request to enable GUI Scripting was denied. These situations make me scratch my head. How can anyone be afraid of GUI Scripting? Is the person saying no to GUI Scripting unfamiliar with what it does? I think so! We hear comments that GUI Scripting is a security risk, or that it could enable dangerous actions. To this all I can say is NO!!!! The security around GUI Scripting has also been improved in the ECC6 release. You can now turn it on for specific users, just in case your IT team is still nervous. I hope that if you read this, you will feel safer enabling GUI Scripting and automating transactions in SAP with Transaction. We will keep adding features and enabling more time savings in SAP for our customers.